The goal of the laboratory of Dr. Sylvain Doré is to discover new mechanisms that limit neuronal dysfunction associated with stroke (e.g. IS, ICH, SAH), traumatic brain injury (TBI), Alzheimer disease (AD), aging and other neurological disorders. The overall goal is to slow down the progression of the disease, and ultimately stop it. To do so, the aim is to limit cell death resulting from either acute and/or chronic neurodegenerative conditions, re-establish normal cerebral blood flow, limit inflammation, and restore regular cellular functions. Using a variety of in vitro and in vivo protocols, using preclinical and human specimens, several new hypotheses and potential therapies are being investigated and developed. One objective is focused on understanding the unique properties of hemoglobin, heme and iron in the brain using cellular/molecular techniques and various models of stroke, traumatic brain injury/concussion, Alzheimer disease and aging. New knowledge is gained specifically, by investigating the action and the role of activity of the heme oxygenase enzyme and its unique bioactive metabolites, namely, carbon monoxide, iron, biliverdin, and bilirubin. Thirdly our lab provides molecular evidence for the potential therapeutic applications of complementary and alternative medicines (CAM). 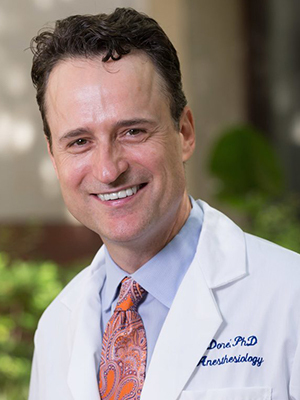 Using cultures of neurons and brain tissues, Dr. Doré has observed that pre-treatment with a standardized extract of Ginkgo biloba or Ginseng could alter the presence of specific genes/proteins important in neuronal function. Individual components of the extract are ineffective, supporting the synergistic principals of Chinese medicine. Similar experiments and results have been obtained using resveratrol, which appears to be an active ingredient concentrated in red wines, and which has been proposed to explain some of the beneficial effects associated with the so called “French Paradox.” These alternative medicines could provide resistance against damage induced by free radicals, the toxins that are generated with aging and are the hallmark of many neurodegenerative processes. Ultimately, the aim is to perform basic research using innovative tools to test original hypotheses and find new treatments that could have clinical applications for the population. Leclerc JL, Blackburn S, Neal D, Mendez NV, Wharton JA, Waters MF, Doré S. Haptoglobin phenotype predicts the development of focal and global cerebral vasospasm and may influence outcomes after aneurysmal subarachnoid hemorrhage. Proc Natl Acad Sci 112:1155-60, 2015.